A recent study commissioned by Gerber Life confirms that parents with young children find it difficult to save for college. They identify two main reasons — mortgage/rent payments and general household bills. What’s a parent to do? Stop stressing and do what you can. Finding ways to save for college, even a little bit each month, can add up to a lot of money over time. The secret is getting started early and committing to a regular schedule for saving. For example, with the Gerber Life College Plan, if you’re able to set aside about $1.25 a day — roughly the cost of a daily cup of coffee — you could save $10,000 for college in 18 years. 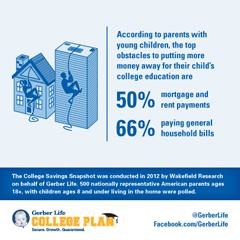 The sooner you start saving for college with the Gerber Life College Plan, the more money you can accumulate.